There wasn’t an inkling, a sign or a hint. Perhaps it was because we were away from the norm, the everyday. Away from our house in Malaysia with the monkeys across the road swinging in the trees and the fat lazy snakes in the front garden. From the moment G announced he had work to do in Australia I started picturing the first Little Traveler and I back there, soaking up its normality. Morning TV in the background as we ate our toast, regular supermarkets packed with familiar brands and trips to the park with old friends. It took three minutes to pack. Within a week I’d found the Nirvana I’d dreamed of. I’d snuck away for a slice of the old life. We’d gone back to the same coffee shop, the same menu, the same table. Girlfriends, really good girlfriends, together again, ordering coffee after coffee. We talked non stop while we slurped and chewed our way through breakfast. 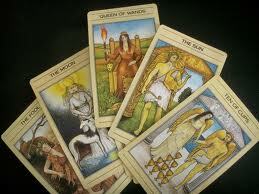 When we were done someone said “Let’s go and have our Tarot Cards read”. We’d all done it before, sometimes with freakishly accurate results. It took three minutes to pay the bill and go. Her name was Annie, we found her at the same table, the same stall. Her smile came from somewhere deep behind her eyes, she seemed happy to see us all again and was mildly amused with our excitement. We all crowded around her table, reminding her of our stories, our previous visits. We congratulated her on the parts she’d got right and politely didn’t mention the bits that didn’t make any sense. We all laughed. Someone raised an eyebrow. I assured everyone that I wasn’t pregnant but thanked them for the vote of confidence. Later, I arrived home and retold the story to G, he laughed. He then recalled his trip to see Annie a couple of years earlier, how she’d perfectly described the cities we would live in. More importantly though, he thought about last nights dinner, how I’d proudly announced that I’d roasted a chicken, except I hadn’t. There was a baking tray full of vegetables but no chicken. Somehow, I’d ‘misplaced’ it. He discovered the raw, lonely chicken in the laundry, in the washing basket. It look three minutes for him to suggest I go to the pharmacy and buy a pregnancy test. Three minutes and two blue lines later – our second Little Traveller was on her way. Tomorrow, you will be nine. You have eyes that make people sigh out loud and behind those eyes is a thinker. I watch you, watching others, I watch you thinking. You love to cuddle. You have a short fuze but it’s always doused with a fast apology. You always laugh the loudest and longest. There wasn’t an inkling, a sign or a hint. There was never a prediction. You were always a statement.